Specials only available on specified day until sold out. Raw zucchini noodles tossed in garlic, olive oil, and basil hemp pesto. 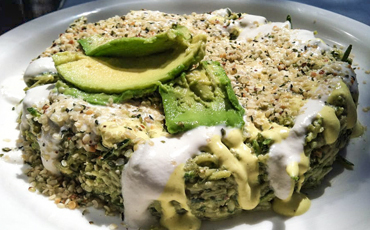 Topped with avocado, hemp seed, and vegan parmesan. 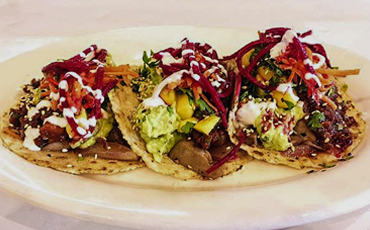 Three (3) grilled portabella tacos with onion, garlic, house guacamole & pico de gallo, mango, and toasted sesame seed. Garnished with house pickled beet and cashew crème. 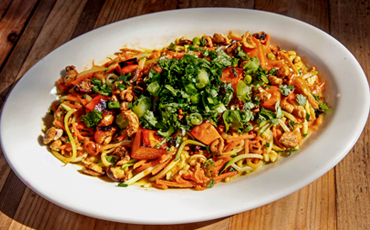 Zucchini and carrot noodles, bell pepper, roasted cashew, grilled sweet potato, grilled onion/cilantro/basil, ginger, garlic, coconut oil, and goji cashew cream sauce. 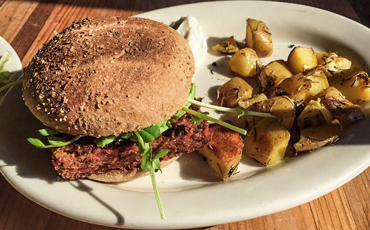 Vegan burger patty served up on a whole wheat vegan bun (contains gluten) with vegan aioli and house-made stout dijon. Served with your choice of roasted rosemary potatoes or side salad. Curry potato, black beans, veggies, and avocado wrapped in a house-made corn tortilla. 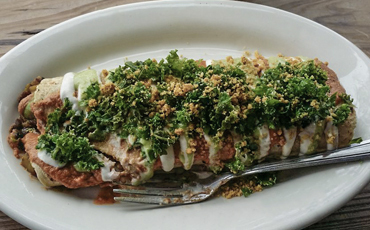 Topped with our sesame tomato sauce, cashew crème, tomatillo sauce, marinated kale, vegan walnut parmesan, and sprouts.